I want to puke when I eat Cheese Nips. Cheez-Its may cost more but taste a lot better. Cheez Its taste better AT FIRST but for some reason start tasting nasty after a bit to me. I’ll go with Nips overall, they have a milder flavor that doesn’t get old to me. Cheeze its are far superior to Nips. You gave a good description of both crackers except I would add the strange after taste Nips leave behind and don’t taste much like cheese. The only other distinct difference in our home, Cheese Nips are better if we are watching our weight, simply because we will never open the box! Cheese Nip are cool at 98 cents a box, if you are on a budget, that is. Cheez its are far more superior in taste. Yes, they do cost twice as much as the Nips, but you get what you pay for. It’s kind of like do you want tilapia or sea bass…. Cheez it’s all day every day, I hate to say it but even off brand cheez it’s are better then cheese nips and cheese nips taste blan to me and don’t have much flavor. I don’t like the salty taste. And they seem to be a family thing. I even converted my mother in law. No contest ITS all the way nips texture and taste are just off. don’t like cheese-its the have no flavour to me. Cheese Nips have a much better taste and aren’t as well I just don’t liek how cheese its taste weird? Not like cheese to me, probably because they barely have any cheese in em and are made of mostly oils. Cheez-its are way better than cheese nips because cheez-its have a better aftertaste and cheese nips have a weird icky aftertaste? Cheez-It by a long shot, Nips are gross, who cares how cheap they are. I have been eating cheez-its for nearly 30 years, and they have gone through good and bad spells and they are extremely batchy. I almost always eat the reduced fat ones now, I like flavor better than what the original ones have become. The best ever are sponge-bob or other shaped cheez-its, they always turn out better. It’s funny how everyone is saying nips are 100 %real cheese.. I prefer the Extra Toasty Cheez-It’s.But before they were introduced I was eating Cheese Nips because they had an authentic cheddar taste to them and were less greasy then regular It’s. This is 2017, Cheese nips come with twice as more than cheezits do, but cheezits are twice the price than cheese nips are, sounds like better deal to me, and some people may think cheese nips are somewhat “Off Brand” but they are made by the people who make Oreos, chips ahoy, Nilla Wafers, etc… They’re good for what the price is, and plus you get twice as more is all I’m saying. I’ll have to go with Cheez-Its. My sons vetoed Cheese Nips, and when I get treats for other kids, some of them complain about Cheese Nips, but no one ever complains about Cheez-Its. I went and bought both It’s and Nips. I prefer Cheez-its over Cheese Nips. Cheese nips taste old and crusty to me. Cheez-its have a better flavor, leaves a pleasant aftertaste and are textured well. Cheez-It crackers are better. I like the saltiness. I agree with the people who said Cheese Nips have a weird after taste. Nips! It’s taste burnt to me. The Nip’s are lighter and cheesier. I’m not sure why people say It’s are saltier, IMO the Nip’s are, I love it! I bought some Nips tonight at the Dollar Tree and I’ll never go back to cheez-its! So funny how everyone has different tastes with these crackers lol! I was 100% Cheez-its for years, but too much salt is no good. The Nips took a bit of getting used to, but that’s what I get now. Funny thing that they are both made with REAL cheese and Mondelez claims cheez it’s are not. The false claims are not ok but I still go with their product over Sunshine Biscuits. Unless we’re talking cheddar jack cheez its. Then its game over. Cheez its are gross. I like cheese nips so much better. Nips are better then cheez its in taste,cost,texture even. I just picked up 3 boxes of these yummy little guys yesterday. Cheez-It White Cheddar in lieu of either of the given choices. Just finished some it’s and nips. Nips are easier to eat the whole box. It’s saltiness prevents me from doing so in one sitting. I have never heard of Cheez Its or Cheez nips. They are both new to me, until I heard about it now. I just tried a Cheez Nips, and it tasted SO bad. So i got Cheez ITS! Cheez Its have good flavor. We all know that Cheez Nips are really cheap, and Cheez ITS are more expnsive. But, I mean what can say? Paying more, you get the better. Cheese Nips forever for me. Cheez-Its taste so salty and burnt to me, like someone baked crackers too long and tried to hide it with a bland cheese powder. Nips actually taste like cheddar cheese. Some people complain about the aftertaste, but the aftertaste is the same one I get when I eat actual cheddar cheese–the kind like Cracker Barrel where you slice it and put it on crackers. That’s just the way cheddar cheese tastes. 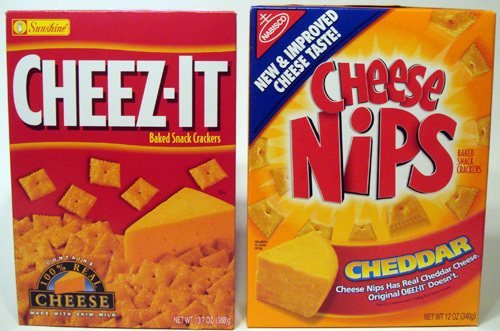 It kind of amazes me how the vast majorty of people prefer Cheez-Its over Nips. But I think the answer there is that people don’t want actual cheese snacks, they want a regular salty snack like potato chips, but with a different taste they aren’t bored of. Cheez-Its don’t have that full-bodied cheese taste like Nips do. The cheese taste is too strong for average people that aren’t cheese lovers and so they prefer the Its. 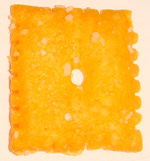 Cheez-It is simply a better tasting cheese cracker than any of the competition, particularly Cheese Nips. Cheez-It crackers have a real cheese taste, full flavored cheese and satisfy the taste buds like no other cheese cracker can! I don’t understand why it is generally more difficult to find the Cheez-IT crackers on store shelves. I generally have to look a little harder to find them, I guess it is a marketing strategy by the competition. But, it does not work with me because I know the taste difference between the two and I will walk away from the aisle if Cheez-IT crackers are no where to be found. I will travel to another store to get my Cheez-It instead of settling for second rate Cheese Nips. Do yourself a favor, try the Cheez-It brand cheese crackers if you haven’t already, your taste buds will delight at the taste of Cheez-IT, I guarantee it! Ever wonder why every time you see a box of Cheese Nips it says Improved flavor? They can’t get it right! I love cheese it’s. Cheese nips have no taste. I don’t understand why people are saying cheese it’s don’t have real cheese it says on the box that it’s real cheese. Cheese Nips are the clear winner. I cannot stand the weird taste and texture of Cheese its. To be honest I enjoy eating both Cheez-it’s and Cheese Nips. Cheeze-Its taste old & burnt. Hate them with a passion. Cheese Nips all the way!!! All you Nip eaters do not know anything. They taste awful compared to Cheeze-Its. Pay the extra buck or two for the amazing taste of Cheeze-Its. woah woah woah,people are saying cheeze nips made them throw up,btw no the crap they didn’t and cheez it’s and cheeze nips are both the same just look different and mildly taste different, but there mostly both delicious . try them both together thats delicious. I’ll eat any flavor of Cheez-Its before I eat even one Cheese Nip. But the disagreement over which one has more flavor is astonishing. 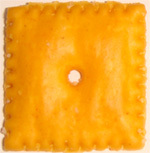 To me, Cheez-Its clearly and obviously have a much bolder flavor, yet some people say they’re bland and have no taste. But to me, Cheese Nips are bland, and what little flavor they do have just isn’t very good. To me, Cheez-Its taste like actual cheese, whereas Cheese Nips taste like a cheap canned cheese sauce that’s been watered down. My favorite flavors of Cheez-Its are the original, white cheddar, and parmesan. Cheese Nips only have one flavor, I think, and that’s a good thing. Until they get that one right, they shouldn’t try to make any other flavors. I have eaten Cheese-it’s most of the time until I tasted Cheese Nips. I feel in love with Cheese Nips. They are the BEST!!! The cheese flavor is great. I introduced my sister-in-law to them and she loves them as well. They are so hard to find. Please restock in Dollar General.